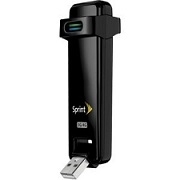 Note: To perform the update, you must have Sprint SmartView open and your U301 USB Modem inserted in the computer in a Ready to Connect state, but do not connect to the Sprint network. Once updated, you should have connection again. This will get the U301 back on track to receive a signal, to broadcast Wi-Fi to the device you want to use.